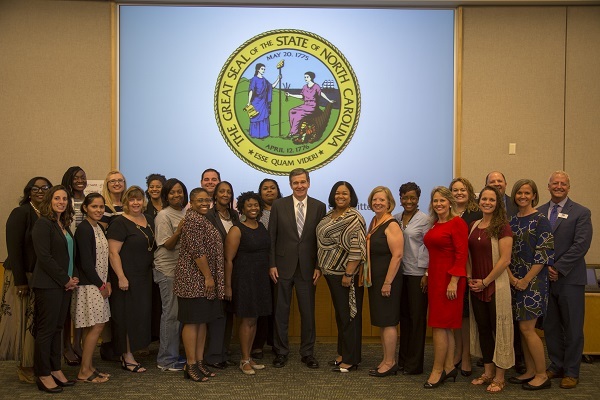 On August 17, 2017 Governor Cooper issued Executive Order 16, establishing the Governor’s Teacher Advisory Committee to advise the Governor on a variety of educational issues. The Committee is comprised of 25 teachers and instructional support personnel appointed by Governor Cooper. The GTAC advises the Governor on a range of education issues, particularly those of importance to teachers. Members of the GTAC serve as education ambassadors, represent the Governor at events, maintain communication with local boards of education, teachers across the state, and other stakeholders, and share opportunities to support teachers.